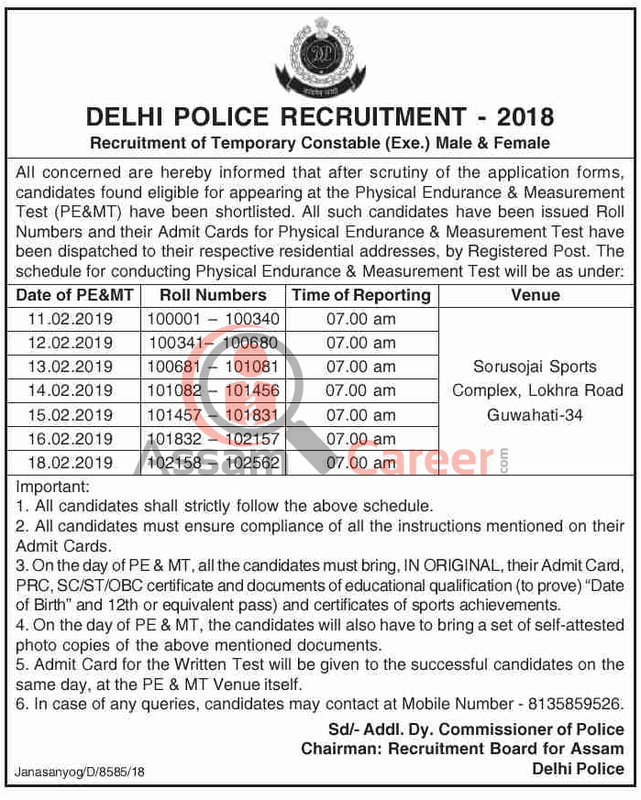 All concerned are hereby informed that after scrutiny of the application forms, candidates found eligible for appearing at the Physical Endurance & Measurement Test (PE&MT) have been shortlisted for the recruitment of Temporary Constable (Exe. ), Male & Female under Delhi Police, Recruitment Board for Assam. 1. All candidates shall strictly follow the above schedule. 2. All candidates must ensure compliance of all the instructions mentioned on their Admit Cards. 3. On the day of PE & MT, all the candidates must bring, IN ORIGINAL, their Admit Card, PRO, SC/ST/OBC certificate and documents of educational qualification (to prove) "Date of Birth" and 12th or equivalent pass) and certificates of sports achievements. 4. On the day of PE & MT, the candidates will also have to bring a set of self-attested photo copies of the above mentioned documents. 5. Admit Card for the Written Test will be given to the successful candidates on the same day, at the PE & MT Venue itself. 6. In case of any queries, candidates may contact at Mobile Number - 8135859526.